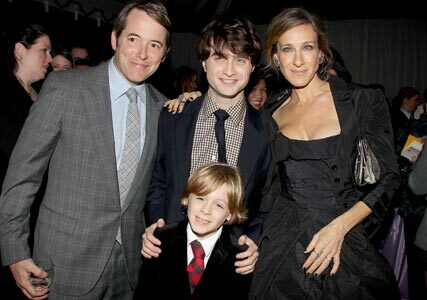 In what can only be described as the most adorable pics we’ve spotted for weeks, Sarah Jessica Parker and Matthew Broderick treated son James to a magical night that most eight-year-olds could only dream of, taking him along to the New York premiere of Harry Potter and the Deathly Hallows Part 1. It may have been the first time that the superstar couple have taken James along for a spot of red carpet posing, but the little boy looked like he was having an absolute ball, getting to meet his HP idols, Daniel Radcliffe and Emma Watson. And something tells us James is a Hermione fan, as he was spotted giving the lovely Emma a letter in return for her autograph. Our hearts are officially melting…..